Most attic doors are poorly designed and cause tremendous energy loss throughout the year. They are often made of thin plywood: an uninsulated material that doesn't perfectly seal air leakage (when new) and only worsens with age (as it warps due to dramatic temperature differences). Consider this: even the tiniest gap around the attic door perimeter -- as small as 1/32 (0.08 cm) -- is like leaving a 5-square inch opening or window open all year! Easy to install by any Do-It-Youselfer (DIY). To install, secure the Attic Tent in place with staples to the surface, then add a bead of silicone caulk around the seam to create an airtight seal. And youre done. Versatile. Attic Tent can be used on folding attic stairs, attic knee doors, and attic scuttle holes. Durable, convenient and improves air quality. The space-age synthetic casing is made up of a high tech material that is adhered to 1/2 thick micro-fiber urethane insulation. The non-corrosive, heavy duty zippers allow easy access to your attic while keeping harmful insulation and dust particles in the attic -- thus improving air quality in your house. Affordable, effective and excellent payback. 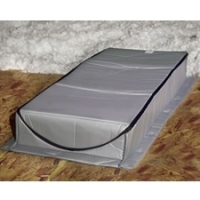 Attic Tent provides an R-value of 3.2 and has been proven to reduce air transfer up to 71%. This means, your Attic Tent will pay for itself in one year, and save you at least $145 per year thereafter. Measure the width across (e.g., it will be between 22” to 30”). Measure the length across (e.g., it will be between 54” to 60”). If you have a standard triple fold attic staircase, measure the height of it when folded (e.g., it will be between 7” to 13”). Height of 7” needed if attic ladder side rail made with a 1x4. Height of 13” needed if attic stairs with ladder side rails made with a 1x5 or 1x6. Place Attic Tent with the zipper heads at the hinge end of the attic stair box. Staple the mounting flange to the rough frame, on all four sides about every 2-3 inches. Align Attic Tent vertical to the back side of the door frame. Insure the zipper end is down. Attach a piece of 1/2 inch plywood measuring, for example, 24” by 35”*, to the adjoining side of the access hole and along the floor joist in the attic as per drawing above. Seal any adjoining areas to insure a good seal. This will allow the required mounting surface for the Attic Tent. Position the Attic Tent over the scuttle hole with the zippers near the access. Staple the Attic Tent flange, around the access frame and extension of plywood. Apply a bead of caulk between the flange, access frame and extension of plywood to provide a tighter seal. * Measurements may vary depending on access dimensions. NOTE: The extra space provided by the extension of plywood will allow room for positioning & storing the access door when entering the attic. This will keep it free from carrying insulation back over the access area, and preventing the blown insulation around the access area from falling back into the home. Open the heavy-duty zippers that allow easy access to the attic. Enter the attic and close the attic door if needed (NOTE: You cannot close the Attic Tent from inside the attic). Remember to close the zipper once you exit the attic.